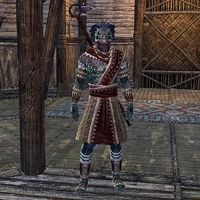 Iskenaaz, an Argonian, is a member of the Bright Throat Tribe and the apprentice of Tree-Minder Pavu. He is determined to protect their Hist tree from anything that could harm or corrupt it and has been tasked to assist you with your investigations on behalf of Tree-Minder Pavu. Iskenaaz: "What were you thinking? Bringing this ... this ... thing here?" Kasa-Jas: "Look at it, Iskenaaz! This was Saxhleel. It should rest with the roots of the Hist." Iskenaaz: "That is an aberration! You'll poison the Hist with its corruption!" Iskenaaz: "I am only thinking of the good of the tribe!" Kasa-Jas: "Let the Tree-Minder decide." Iskenaaz: "We should leave it to the bog. Surely you agree—oh! Tree-Minder! The ojel! Just as you said!" Tree-Minder Pavu: "Greetings. I am Tree-Minder Pavu of the Bright-Throat tribe." Once you've spoken to Tree-Minder Pavu and started the quest Empty Nest, Iskenaaz will become your companion and can be asked for information before starting your investigation. Iskenaaz: "Perhaps a tour of the egg-tender's quarters is of interest? It is just up the way." Iskenaaz: "Our visit should not arouse suspicion, we host many guests, but your discretion would be appreciated." Iskenaaz: "Ah, Keenam [sic]. Mimme. We have a guest very interested in our customs. Please, show them the utmost courtesy." "This is the egg-tenders' dwelling. Please, take a look around. Speak with our root-kin. We Bright-Throats are gracious hosts." Actually, we never got properly introduced. "Forgive me for being hasty! I merely wished to be of use. I am Iskenaaz, voh-vastei to Tree-Minder Pavu. I am at your service. I promise to leave you with a fine impression of our tribe." Where do you think I should start my search? "I don't wish to question your knowledge of such things, but it might be best if you speak with the egg-tenders before visiting the nests. They can speak to anything you would want to know about our eggs." "Oh, I—ah—don't wish to speak ill of anyone of the tribe. I only hear idle gossip from time to time. I'm told Keenam [sic] has the bad habit of speaking his mind too freely and listening poorly, but I have never heard complaint of his egg-tending." I witnessed some of your argument earlier. Why were things so heated? "Oh no, put that from your mind! It is not a normal occurrence, I assure you! My root-brother found that disfigured creature approaching our village. Clearly injured or ill. It died before it could cause any harm. I only meant to keep it that way." "There were similarities, but I question that it was Saxhleel. Maybe once, but not as the thing we saw here. My misguided kin meant only kindness for an unfortunate soul, but that small act could carry grave consequences for our entire tribe." You worry that it's contagious. "Yes, you understand. I would not wish that terrible fate on any of my tribe, or even my enemies! Not that I have enemies. I am very well-liked. And if the Hist was made ill ... I dare not think of it." Voh-Vastei?/What did you call yourself before? Voh-Vastei? "I am her student, and she is my teacher. One day I will commune with the Hist as she does and share its wisdom with the tribe. A great duty and also a great responsibility. You see how it weighs on her. The hardest decisions always fall to her." "Satisfied with your visit here? There is no rush. Anything in particular that caught your interest?" Nothing out of the ordinary other than these herbs. I found them buried in a fruit basket. Oh, this is dragonthorn. We mostly trade it to the Dead-Water tribe, but it's a fairly ordinary medicinal plant. Several of the egg-tenders are skilled herbalists. I don't see any reason it would be hidden intentionally." I think we should move on. "You should visit the uxith, our nest among the roots of the Hist. Perhaps the egg-tenders on duty will provide something more useful." Hold a moment. I think I should speak with the egg-tenders again. "As you wish. I will await you here." Mimme said it has some unsavory uses, but she didn't have specifics. "Then perhaps we have a traitor to the tribe! To think ... it is beyond imagining! Quickly, let us check on the eggs. I pray we will find the truth before something terrible happens!" Iskenaaz: "I will meet you at the uxith. The nesting beds." Iskenaaz: "This is the uxith. The nest where our eggs are cared for." Iskenaaz: "The egg-tenders take every care to ensure that our offspring are healthy and safe." Egg-Tender Meena: "Can you do this another time, Iskenaaz? We're already behind." "This is the uxith. It is normally bustling with activity around bonding time. My egg-kin must be preoccupied with the disturbing events of the day." "Oh, my, Haxara ... she's not still angry with me, is she?" I found more dragonthorn in that empty egg bed. "The empty nest? Those eggs were returned to the Hist! Were the eggs poisoned, or was the poisoner's intent to harm the Hist? We don't know that for certain, but there is a connection here. Where is this trail leading? "You are right, of course. Let me think. Think. Think ...! This dragonthorn looks fresh, so it must have been picked recently. We cultivate ours in a small glade near to the village. That would be the easiest place to gather this much of the herb." It's worth checking out. Whoever gathered the dragonthorn may have left something behind. "Forgive me, but I must report your findings to the Tree-Minder. I will return to your side with all the swiftness of a strangler vine." All right. I'll head to the glade myself. Is Haxara usually this emotional? "Ah—well, yes. She is a sensitive soul. It is what makes her such a skilled egg-tender, but—and I don't wish to speak ill—the river of her heart is so full that it does not take much to flood." I'd still like to talk to her. "I'm sure once she has had time to get a hold of herself, she will return. Perhaps we should continue our search in the mean time?" Iskenaaz: "The glade is not far, I will meet you there as soon as I can." Iskenaaz: "Over here! Look! A body in our drying hut!" "I don't like the look of this, beek-ojel. I will keep my distance until you know it is safe." Iskenaaz: "He's really dead? He looks to be Veeskhleel. You can never be certain with the Ghost People." "What happened here? That dead man is one of the Veeskhleel, the Ghost People tribe! Are they responsible for our troubles?" This Veeskhleel was sent to kill Haxara. "Who would want to kill Haxara? That makes no sense ... and who killed the Veeskhleel? Don't tell me you think Haxara killed this ojel. She averts her gaze from our cookfires for pity of the creatures on the spits. She could never have done this." Look for yourself. She was definitely here and definitely involved with the Veeskhleel. "As mud is my mother, it's true ...! How could she? Giving our eggs to the Veeskhleel, of all people! I don't care if they were not meant to hatch. The Ghost People should never have been allowed to lay a hand on our eggs! We must tell Pavu." "What about Haxara? Let the Veeskhleel take her for what she's done ...! I'm sorry. I did not mean that. They'll kill her, or worse. Haxara will have to face judgement for her actions, but it should be the tribe's judgement. A Dead Aberration will then approach, Iskenaaz will be frightened before it abruptly dies. Iskenaaz: "Ah! It's alive! Don't let it get me ...! Oh." "Another of these twisted branches dies among our roots. This is no coincidence. These things must be the work of the Veeskhleel! Sent to poison our Hist with their corruption!" "The Ghost People tribe. They make their home in the lightless corners of the deep swamp. Veeskhleel only leave their lands to creep through the night and steal the dead!" "Even the brutal Root-House People will return Saxhleel dead to their tribes so they may return to the Hist. Not the Ghost People. They keep those lost souls for themselves. Burying the bodies in the roots of their Hist, or worse." "Profaning them in strange rituals that keep souls from the Hist, or giving the dead legs to wander through the murk as dreadful watchmen. They mean to poison the whole village and steal our dead! We must find where these monstrosities come from!" That one's lost nearly all its scales. It had to have left them somewhere. "We mustn't let this trail go cold. This may be our only chance to find the vile den of the Veeskhleel before they unleash more foulness upon us." We still don't know what happened to Haxara. "All the more reason to keep on the path before us. She may have bested the attacker we found, but perhaps there were others? The only thing certain is that she will not be safe until the Veeskhleel are dealt with." Iskenaaz: "Never in a thousand lifetimes did I imagine I would willingly seek out a Veeskhleel's den." Iskenaaz: "Just looking at these scales makes me itch. Please let it be my imagination." Iskenaaz: "This keeps getting worse and worse! If anyone were to discover that we lost eggs to the Veeskhleel ... we'd never be trusted again." Iskenaaz: "This might be working! This might be working ...."
Iskenaaz: "Ugh, that smell. We must be near the Blight Bog Sump. Of course this is where the Veeskhleel would make their home." "We should not linger, lest we fall ill to the same blight as those warped branches shedding all their leaves." Haxara: "I tried... I tried to save them. It all went wrong." "Oh, Haxara what have you done ...."
"We are in the den of the Veeskhleel now. My spines quake at the thought of what we will find in this place." What do you think the Veeskhleel have been doing in here? "Nothing good. This place reeks of death and foulness. Saxhleel have a strong constitution, but the air here makes me ill."
I'll keep an eye out for clues. Iskenaaz: "Pee-yew. A terrible odor. It sticks in my throat." Iskenaaz: "Xuth! More of these creatures among broken eggs. Piled up like refuse." Iskenaaz: "Ugh—don't breathe it! My nose burns from here." "We should take Haxara and go. Surely you've gathered enough to prove how dire the situation is?" I found some of Ree-Nakal's writings. She's been experimenting on these eggs. "No, no, no. You're telling me these creatures ... they came from our eggs? I thought I was prepared for the worst, but this—this is abomination! I must warn Pavu! She will know what to do." What about stopping the Veeskhleel? "We are a peaceful tribe! Our village is not prepared to face monsters made from their own flesh and blood! I must warn them. If you wish to wade deeper into foul waters, I will ask the Hist to watch over you." Go on. I'll stop Ree-Nakal. Iskenaaz: "Pavu will know what to do. She must!" Iskenaaz: "Tree-Minder, if you saw what I saw, there would be no question." Haxara: "If you hadn't run, you might understand!" Tree-Minder Pavu : "Peace. Here is the one I must hear from." "Please, you have seen the horrors that Ree-Nakal wrought. She soaked that corruption into the very essence of her creations. We cannot allow her poisons to seep into our roots. I beg you." You really think she's that much of a danger to your tribe? "You think me cruel to believe so? I swear to you, it gives me no joy. One day I might even forgive Haxara for what she's done, but if there is even the smallest chance that showing her pity will harm the tribe, I will close my heart a thousand times." What do you propose we do with them? "They should go. Far away from our tribe and our Hist—from any Hist—never to trouble us again." What if I decide she should stay? "If the Hist believes you are right, then you are right. I will have to hope we did not misjudge its intentions." If you decided that Haxara and her child should leave the village, Iskenaaz will say the following if you speak to him. "I know it was a difficult decision, but you have done the right thing. Her selfish desires jeopardized the well-being of the entire tribe, and her staying here would do so again. This was the only way." Iskenaaz can be re-encountered as a visitor to Root-Whisper Village and is there to witness the reawakening of the Hist tree, though he seems to be more excited at the prospect of a new tribe: "Another Hist, another tribe to trade with! All is well in the marsh." Iskenaaz refers to Keenem as Keenam. Even if you speak with him before entering the Egg-Tender's quarters, you still speak to him as though you had not been introduced yet. This page was last modified on 2 March 2019, at 01:20.